Easter is a time of renewal, prayer and thanksgiving. But perhaps above all, this spring holiday is the time for the neighborhood Easter egg hunt. This quintessentially Easter custom was probably first introduced to America in the early 1800s by German immigrants, who brought with them to the new country their old tradition of the Oschter Haws. For German children, the Oschter Haws – or Easter Bunny – was the highlight of their Easter celebrations. The Haws would arrive on Easter morning, delighting them by laying colored eggs in nests. 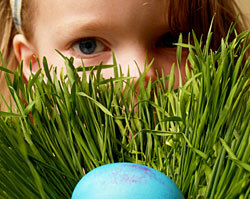 Today, little children – and more than a few adults – get the same joy from an old fashioned Easter egg hunt. Whether you want to a host an egg hunting party just for your own two children or for 200 of your closest neighborhood friends, these tips will help you to make your event a hopping success. The Easter egg hunt originally featured delicately painted chicken eggs. Today, most egg hunting parties are a bit more practical, using plastic eggs stuffed with prizes instead. If this is your first party, consider ordering your eggs in bulk from a place the Oriental Trading Company. You can hold on to your eggs for the next year by asking parents to return them once their kids have emptied them of their prizes. Either way, plan on hiding at least a half dozen eggs per child. Candy is a perennial favorite for stuffing your Easter eggs, but if you want to branch out, try mini-packets of colored pencils, temporary tattoos or stickers. For older children, you can use a lottery system, stuffing the eggs with slips of numbered paper. After the hunt, draw out numbers from a hat to award larger prizes like a new board game, pizza pie or ITunes gift card. Plan to hide your eggs the night before Easter Sunday. Consider making a map for yourself so you don’t lose any of your eggs that aren’t found the next day. If you are planning to invite children of varied ages to your Easter egg hunt, you might want to divvy up your lawn up into age-appropriate zones. For little ones two and under, carpet a smaller area with dozens of eggs. The fun in practicing their fine motor skills is more than enough challenge for this toddling group. Preschoolers aged three to five are beginning to understand and enjoy hide-n-seek, so this is a good age to start covering up some eggs. Of course, don’t hide them anywhere precarious that requires high climbing. Stick to putting them in flowerbeds, under piles of leaves and inside drain pipes. School-age children love a challenge, so get creative and use a ladder when hiding their eggs! Plan to serve some light finger foods, like baby carrots and crust-less egg salad sandwiches. Set out your platters from the start of your party, so that adults can enjoy the nosh while their kids are hunting. Celebrate the end of the hunt with a sweet tray of Easter sugar cookies or a bunny-shaped cake with a furry frosting of coconut. Every little hunter needs a place to stash his eggy loot, so ask your guests to bring an Easter egg basket from home. Or, you can try our fun craft activity (below) to make your own Bunny Basket before the hunting commences.